There will be only one of them this year. People will be getting all bent out of shape fearing something bad is gonna happen or bad luck will be upon them today. 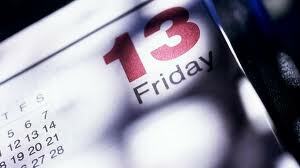 If you are one of these people then you suffer from friggatriskaidekaphobia: Fear of Friday the 13th. Yes that is a word I found on the web today. I could never just make it up, much less spell it. and Triskaidekaphobia: Fear of the number 13. Did you know that over 20 million people have this? Most will avoid any normal routine and stay in there homes. Many buildings will not have a 13th floor and a lot of airports do not have a 13th gate. Crazy, isn't it? Ever since the 14th century this day has been considered unlucky. It has even been said Jesus that was crucified on a Friday. I don't know. Well, I am not a superstitious person, I do not believe things happen or don't happen by luck. I think superstitious things happen to superstitious people. Bad things happen to people everyday. But if it happens on Friday 13th, then they automatically blame it on the date. I kid around about it being Friday the 13th but I do not believe in all the hoax and rumors! Its just another day and its going to be a great day. I actually have the day off at work, (It may be a bad day for the office, Ha!) . In fact I'm traveling today to a wedding. So, All you with friggatriskaidekaphobia, lighten up. Leave a comment on how you feel about Fridays and thirteens. This could be interesting. Some of the superstitions make sense to me. I don't walk under ladders. The Friday the 13th thing? If I notice, I don't care. And we have two black cats, so that one isn't a problem either. not worried at all. bad luck has been following me around all year. I think it's silly, good things usually happen on these days. Just right now there is a man at the door with a hockey mask and a machete who will most likely offer some lawn maintenance services for a reasonable price. I like the entry, I have known some superstitious folk but I have never been one. (But, but a lot of bad things do happen to me on Friday the 13th, so just in case, I ain't going out! ;-) Love from the banks of the Catawba! I had exactly ONE very bad car accident in my life. Thankfully, we were all spared, but the car was completely totaled - wrapped right around a tree. And it was on Friday the 13th. So I am always wary.....yikes. Be safe in your travels and have a great time at the wedding! Friday the 13th was great at dance clubs. There was a time people wouldn't show up.